A Custom Audience from your Website is a targeting option that lets you reach people who have visited your website on Facebook by using a tracking pixel on your website. This is useful when retargeting users who have indicated interest in your products or services, but did not take your desired action. Copy and paste the entire code between the <head> and </head> tags of ALL pages of your website. 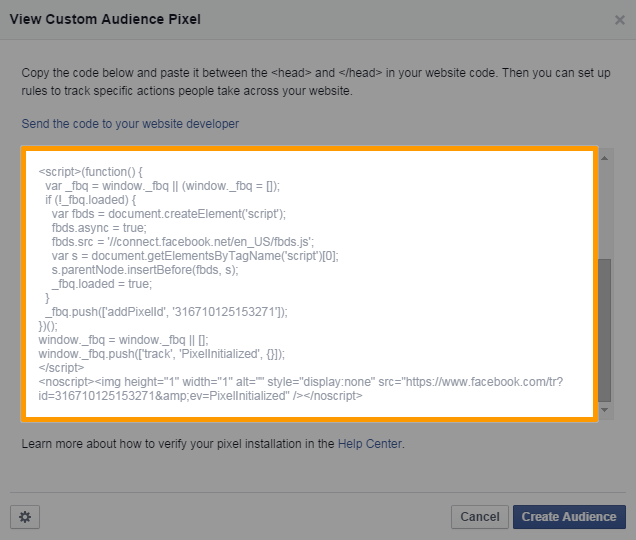 The Facebook custom audience pixel is different from the conversion pixel. If you are using a website template, you can paste this code once on your website header and it will automatically fire everytime a page is loaded. If you are using standalone landing pages, install the code on all landing page variants and confirmation/thank you pages. If you are using a third party platform and direct users from your website to a different domain for bookings or purchases, install the code as well on all pages that your users pass through, up to the end of the transaction.